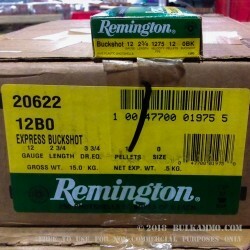 This 12 Gauge shotshell from Remington’s Express line of ammunition is loaded with 12 pellets of 0 buckshot. 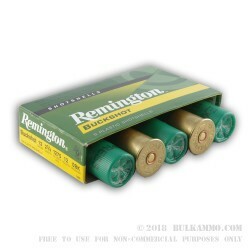 The .32” diameter pellets excel for hunting, especially in environments with a lot of heavy brush which isn’t conducive for firing a rifle bullet. 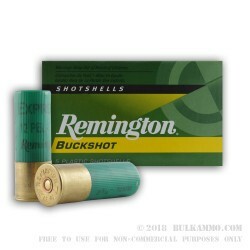 They’re also suited for home defense, as with this shell’s 1,275 fps muzzle velocity they’ve more than enough power to take down a human-sized target. Please take note, however, that single-aught goes through walls as though they were made of graham crackers, so you want to be certain of just what is behind any wall you might fire at. 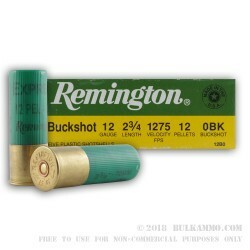 This shotshell also features heavy cushioning behind its shot column, granulated polymer buffering to maintain pellet roundness for tight and even patterns, and Remington’s own Power-Piston one-piece wad system for assured pattern consistency. With 250 of these hard-hitting green firecrackers at your disposal, no buck, target, or human-sized home intrusion will be beyond your reach.